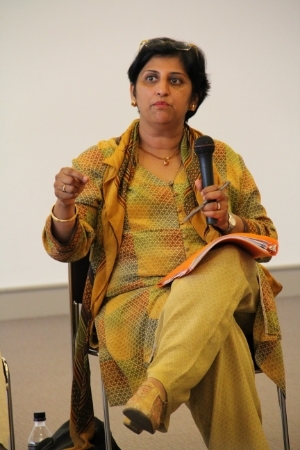 Margaret Abraham addressing a group of sociology students and teachers in Yokohama, Japan. Margaret Abraham has been teaching for two decades at Hofstra University and is a former Chair of the Department of Sociology and former Director of Women’s Studies. She is currently Special Advisor to the Provost for Diversity Initiatives. "As a teacher I have four broad goals. First, to demonstrate to my students, how sociology offers important ways to examine, understand, and influence the world we live in. A second goal is to develop in students the important skills of critical thinking and analysis. A third important goal is to inculcate in my students a global perspective. Finally, a fourth goal is to address the complexity of issues of race, ethnicity, class, gender, and citizenship in understanding social relations and social institutions both within the United States and globally." With colleagues and students of Sociology at Hofstra University. During her ongoing career at Hofstra University, she has taught more than 25 courses on identity, citizenship, violence against women and women’s studies, areas that she is concerned with as a researcher, advocate and as citizen.